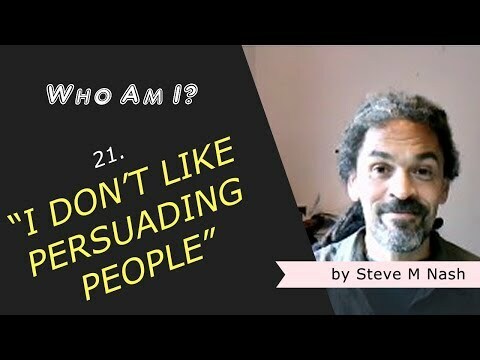 I Don't Like 'Persuading' People | Who Am I? Over time, I’ve started to conclude that I don’t like persuading people to see things my way. But does that just mean I don’t like arguing with people, or I don’t like finding out I might be wrong, or does it mean I don’t like doing things I think I’m not good at doing? How do I know I don’t like persuading people to see things ‘my way’? What is ‘my way’ and why do I think it is different to ‘your way’? Let me just acknowledge that it isn’t true of me (but sometimes it is). Let me notice that when you look back at the wake of your life, you have to call it ‘something’, don’t you, what you notice. And let me acknowledge that persuasion is just another form of communication; persuasion is just another word for thinking. So at its core, persuasion is getting someone to believe a thought that you believe in.